Purpose-built for use with the dynamic computing resources available from Amazon Web Services ™ the Intel Lustre* solution provides the fast, massively scalable storage software needed to accelerate performance, even on complex workloads. Intel is a driving force behind the development of Lustre, and committed to providing fast, scalable, and cost effective storage with added support and manageability. 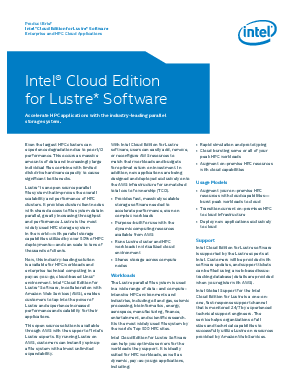 Intel ® Enterprise Edition for Lustre* software undation for dynamic AWS-based workloads. Now you can innovate on your problem, not your infrastructure.